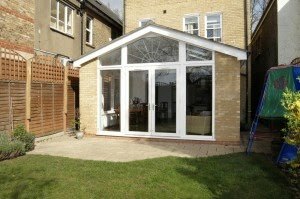 As the housing market is slowing, sales are down, people are choosing to improve rather than move, so an extension or conservatory from Anglian Home Improvements is probably the best way to add value to your home for when the market picks up again! Well, Anglian offer a variety of ways to extend your home, one of the latest ways to extend your home is with an Anglian Panoramic Extension. It comes in 4 different styles to suit your home, Elizabethan, Regency, Lean to and Victorian. By doing so you are adding another room to your house, which makes a perfect dining room or just more living area. Each panoramic extension fitted by Anglian is bespoke, made specifically for your house making it unique to you! As the panoramic extension is made specifically for your home, you have many choices available, such as the windows that are installed, including the style and the type of finish and even have decorative glass put into the sealed units for you too! The same applies for the type of doors you want, giving you a wide selection of finishes on your panoramic extension, highlighting the individuality of you and your home. Whatever you choose will have the superb security to give you peace of mind when you aren’t benefitting from your gorgeous panoramic extension. The windows surrounding you make for gorgeous viewing across your freshly cut lawn and pretty flowers that are just blooming. With the French doors open in the beautiful summer weather (especially at the minute), the smell of BBQ’s cooking in the air, and feeling the sun’s rays caress your face leaves you feeling warm, relaxed and happy you made the right choice by choosing Anglian. 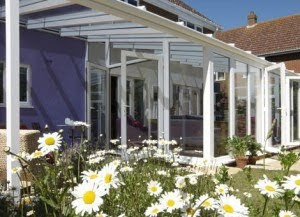 However, if a panoramic extension is not individual enough for you, why not get an Anglian conservatory verandah? This is being touted as the saviour of the British summer, as it is not only a conservatory, but a sheltered area extended onto your conservatory to chill, do a BBQ or anything you couldn’t do in the rain! This Anglian unique design offers all of the normal benefits of a conservatory, but with the verandah you have so many more options available to you, especially as the British summer weather is so unpredictable. There is nothing worse than planning a big party with a BBQ, everyone arriving and just as the BBQ is going nicely, there’s a big rumble of thunder and the heavens open, forcing you all inside. The verandah changes this concept, you will still have an area to do the BBQ and entertain your guests! It completely takes out relying on the weather, luck no longer plays a part of the day. The conservatory verandah is built to BS6399 standards and the roof is tested to withstand 0.6kN load which is almost equal to 2 foot of fresh un-compacted snow. It can also withstand an upward force of 2kN per support post, which is roughly the equivalent of 95mph of wind pressure, which is Hurricane Force 12 on the Beaufort scale. No chance of this conservatory blowing away! Make a statement with an Anglian conservatory verandah and make your neighbours jealous of you enjoying the summer months, without the worry of the weather!